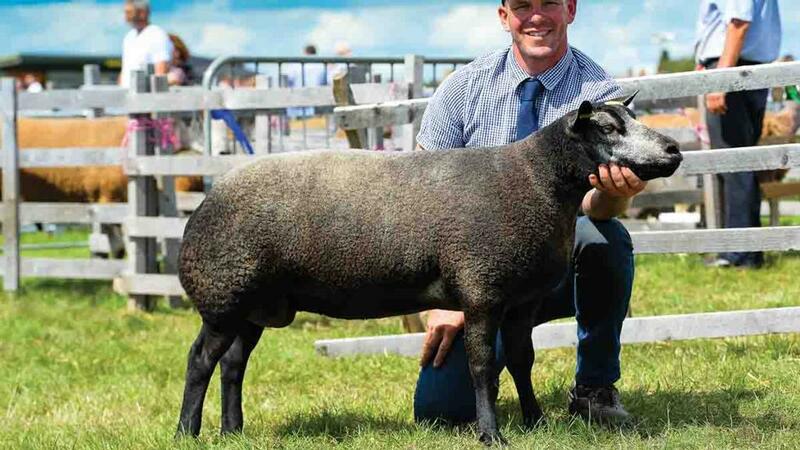 It was the one crop Blue Texel ewe from Kyla Dodd, Kirkpatrick Fleming, which took the supreme honours in the sheep inter-breed at Dumfries show on its first outing this season. Inter-breed sheep and Blue Texel champion, a one crop ewe from Kyla Dodd, Kirkpatrick Fleming. Residing with her parents, Robbie and Susan Dodd’s, pedigree flock and by a Dutch imported sire, it was bought by the family from Carlisle last year for 900gns. Judge Russel Gray, Lanark, said it had fantastic presence in the ring and was a great example of the breed. 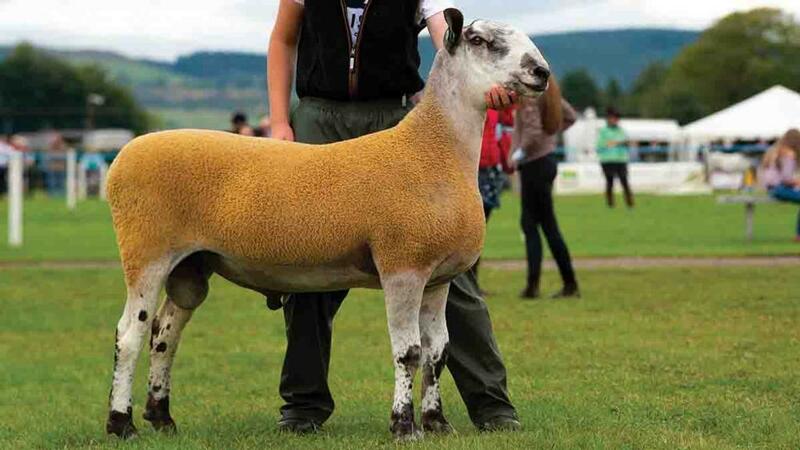 His reserve was a crossing type Bluefaced Leicester shearling ram from Alec and Anders Brown, Thornhill. Bought from Hawes last year for 12,000gns, it is jointly owned by Mr Brown, John Park, Sanquhar and Messrs McGregor, Stirling. The pair run 34 Blue females in their Macqueston flock, alongside some 900 Scottish Blackface ewes. 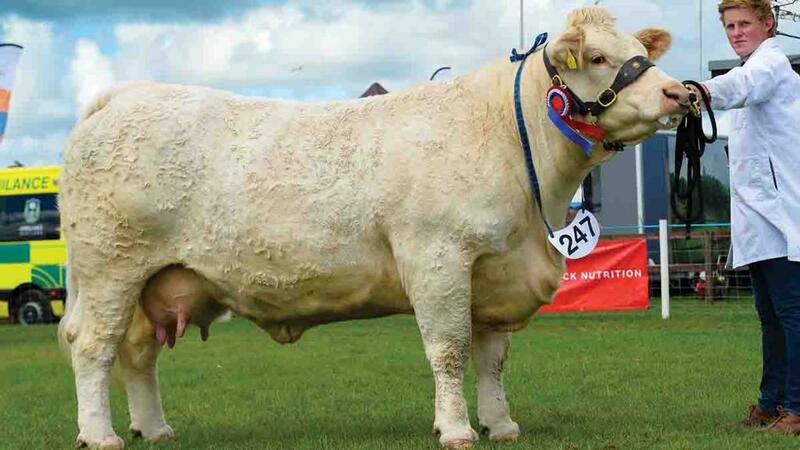 A Charolais from Jim and Patricia Goldie, Annan, was took top honours in the beef championship. The April-2013 born cow, Monaduffhouse Ingol Gold, was gifted to their seven-year-old son, Jim, as a two-year-old and was shown with its May-born heifer calf, Newbie Mains Orla, at foot. This was its second time taking the top spot at Dumfries, having taken the beef championship at the show three years ago. Judge Martin Irvine, Drummuir, said it was one of the hardest beef inter-breeds he has judged. 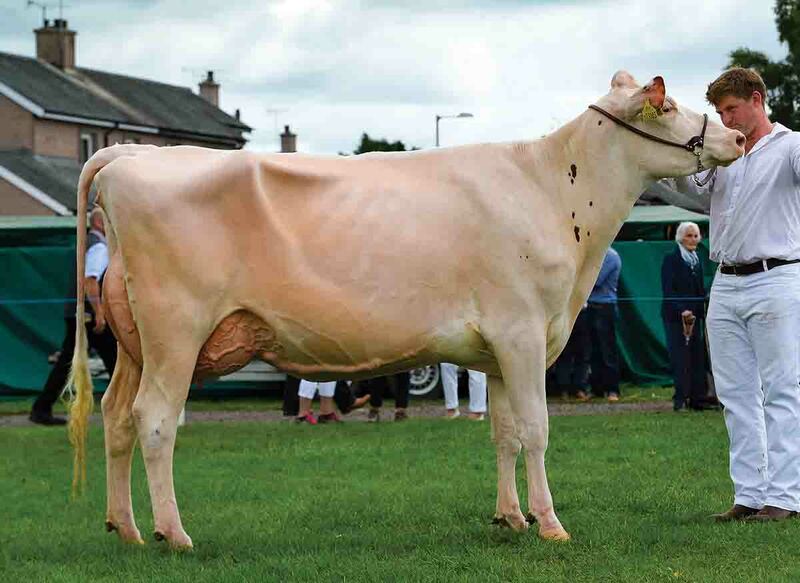 Inter-breed beef and Charolais champion, Monaduffhouse Ingol Gold, from J. and P. Goldie, Annan. Inter-breed dairy and Holstein champion, Logan Integral Jodie Red 3, from B. Yates, Castle Douglas. The reserve champion was the Hereford, Coley 1 Pilot, a January-2017 born bull from Heather Whittaker, Halifax. 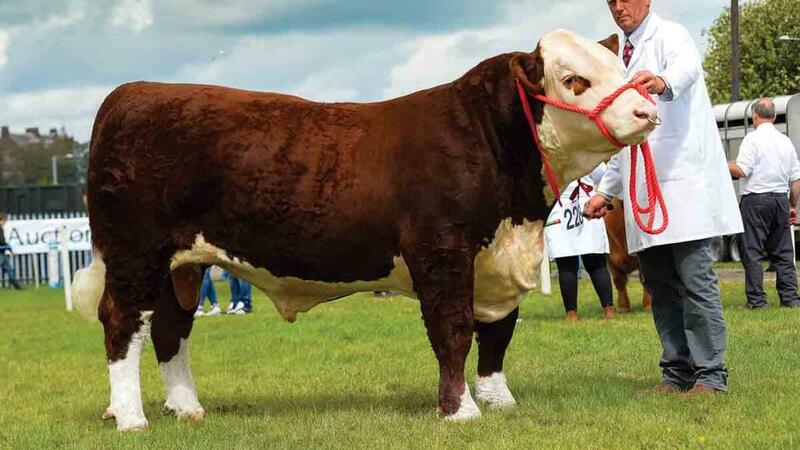 A homebred Coley 1 Maverick son, it has previously taken breed championships at this year’s Royal Highland and Great Yorkshire shows and also stood champion in the Scottish National Hereford Show at Dumfries earlier in the day. In the dairy rings, it was the fourth breed championship in a row for Brian Yates and family, Castle Douglas, awarded this year to the heifer, Logan Integral Jodie Red 3. The December-2015 born Blondin Integral daughter is classified VG87 and was shown giving 37kg daily having calved in January. In reserve for the second year running was Willowfield Winney 2, jointly owned by the Firm of D.M. Lindsay, Lanark, and Howard and Linda Batty, Derby. 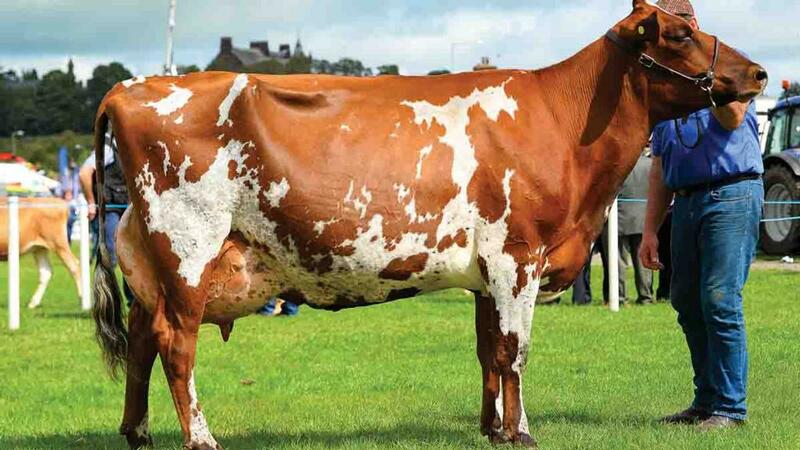 The Westmossgiel Modern Reality daughter was shown giving 52kg daily, having calved in May with its third, and is no stranger to the ring having taken the dairy championship at the Great Yorkshire and Ayrshire champion at the Royal Highland shows this year. Inter-breed sheep reserve and Bluefaced Leicester crossing type champion from J. and A. Brown. Inter-breed (R. Gray, Lanark) Sup., R. and S. Dodd (Blue Texel); res., J. and A. Brown (Bluefaced Leicester crossing type). Cheviot (M. Little, Langholm) Sup., J. Common and Son; res., R. H. Paton. Scottish Blackface (W. McClymont, Selkirk) Sup., W. Ramsay and Sons; res., I. R. S. Bond. Suffolk (W. Fleming, Carluke) Sup., L. Harkness; res., P. and D. Reid. Bluefaced Leicester crossing type (I. Minto, Dolphinton) Sup., J. and A. Brown; res., S. Park and E. Mills. Bluefaced Leicester traditional type (N. Robinson, Hexham) Sup., R. Neill; res., F.D. Kennedy. Bluefaced Leicester traditional type progeny groups (N. Robinson) Sup., R. Neill; res., F.D. Kennedy. Kerry Hill (D. Steen, Moffat) Sup., S. and A. Burgess; res., C.R. Graham and Sons. Texel (N. Hamill, Crumlin) Sup. and res, Douganhill Farms. Blue Texel (J. Trough, Carluke) Sup. and res., R. and S. Dodd. Scotch Mule (S. Guild, Cumock) Sup., J. and A. Brown; res., G. Allan. Charollais (L. Coghill, Birsay) Sup. and res., B. Radley. Beltex (G. Anderson, Dumfries) Sup., A. and J. Campbell; res., J. L. McMillan. Lleyn (L. Jenkinson, Kirkby Stephen) Sup., D. Steen; res., T. and I. Walling. Ryeland (C. Bateman, Brecon) Sup., E. and J. Henderson; res., S. Bryden. Coloured Ryeland (D. Robinson, Wigton) Sup., L. White; res., S. and J. E. Fisher and M.J. Hoggarth. Zwartbles (S. Braid, Moffat) Sup., C. Rae; res., R. Torbet. British Berrichon (R. Rennie, Kelso) Sup., F. Barbour; res., R. Powell. Any other continental pure or cross bred (L. Coghill, Birsay) Sup., I. McConnell (Rouge) res., A. Jackson. Any other native pure or cross bred (R. McKenzie) Sup., C. Carruthers; res., D. and W. Crew. Inter-breed beef reserve and Hereford champion, Coley 1 Pilot, from Heather Whittaker, Halifax. Inter-breed (M. Irvine, Drummuir) Sup., J. and P. Goldie, Monaduffhouse Ingol Gold (Charolais); res., H. Whittaker, Coley 1 Pilot (Hereford). Galloway (A. McConchie, Gatehouse of Fleet) Sup., Troloss Farms, Troloss Farms Dec; res., J. and S. Ross. Belted Galloway (T. Oliver, Newcastle Upon Tyne) Sup., Mochrum Estate, Mochrum Layla; res., G. Milroy, Lipwood Tilly. Aberdeen Angus (J. Gilmour, Macmerry) Sup., C. R. Graham and Sons, Carruthers Eden Park; res., C. Rodger, Dalcrest Joylady Erica. Beef Shorthorn (G. McCulloch, Thirsk) Sup., R. and L. Thomson, Shawhill Leroy; res., J. Landers, Cairnsmore Lois. Hereford (W. Livesay, Leicester) Sup., H. Whittaker, Coley 1 Pilot; res., J.R.B. Wilson and Sons, Romany 1 Lucy. British Blue (W.Hunter, Insch) Sup., D. and L. Watret, Criffelview Kendra; res., I. McGarva, Abington Maisey. Charolais (S. Hunter) Sup., J. and P. Goldie, Monaduffhouse Ingol Gold; res., R. McCornick, Ricnick Nelson. Simmental (S. Hunter) Sup., J. and P. Goldie, Newbiemains Designer Wag; res., J. and P. Goldie, Skerrington Iceman. Limousin (S. Hunter) Sup., A. and S. Stevenson, Burnbank Neve; res., D. and R. Cornthwaite, Maybe Magdal. Any other beef breed (J. Gilmour, Macmerry) Sup., D. Irving, Enterprise Stella (South Devon); res., Mr Hulland (Longhorn). Commercial (S. Henderson, Dumfries) Sup. and res., A. and M. Fitzsimon. Inter-breed dairy reserve and Ayrshire champion, Willowfield Winney 2, from the Firm of D.M. Lindsay, Lanark. Inter-breed (G. Lawrie, Prestwick) Sup., B. Yates, Logan Integral Jodie Red 3 (Holstein); res., Firm of D.M. Lindsay, Willowfield Winney 2 (Ayrshire). Ayrshire (G. Lawrie, Prestwick) Sup., Firm of D.M. Lindsay, Willowfield Winney 2; res., Iain Service and Co.
Holstein (I. Watson, Celeraine) Sup., B. Yates, Logan Integral Jodie Red 3; res., B. and V. Davidson. Jersey (G. Lawrie) Sup., J. R. Heuchan and Son, Gerranton Topeka; res., J.R. Heuchan and Son, Gerranton Barnrbas Megan.